The much loved Aussie Bulldog was given its name by two QLD Breeders, Tina and Noel Green, and was then founded by two separate breeding programs. 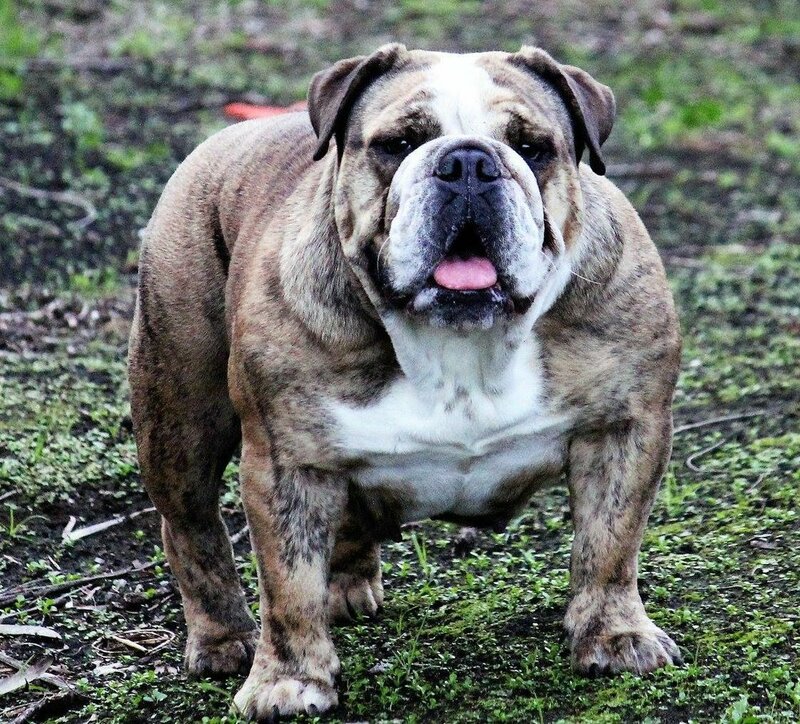 Many years of coordinated breeding went into creating the first two lines of Bulldog type breeds that ultimately resulted in the Aussie Bulldog. The intention and purpose of creating the Aussie Bulldog was to provide Australia with a Bulldog that retained the honourable traits of the Bulldog breed, such as loyalty, nature, companionship, impressive structure, however is more functional and appropriate for the Australian conditions. The Aussie Bulldog has become quite a popular breed since its inception in 1997. There are now a number of Clubs where Aussie Bulldog Breeders are dedicated, like us, to continually work to improve and develop the breed, in the hope that one day the breed with become recognised. The Aussie Bulldog is a dog of stamina, their personality has a gravitational pull and draws you deep into their heart and soul, they have a very sound temperament and while they can be quite stubborn, they are certainly controllable - we wish you good luck getting your Aussie Bulldog up from their warm bed to go outside and into the cold. One of the Aussie Bulldog's main attributes is the structure of his head. It is very strong and square in appearance, with good depth/width of muzzle and a pronounced gap between the eyes. Much like human genetics, the Aussie Bulldog is not without its faults. As Breeders, we do our very best to eliminate health problems, however just as much effort is put into ensuring the breed is as healthy as it is well structured and natured. Aussie Bulldog breeders strive for continued consistency of a Bulldog that should produce males around 18/20 inches to the shoulder, solid & compact with good mussle tone, and females around 17/19 inches to the shoulder. The body structure should denote great strength with good thickness of bone. Nice long bodies are preferred for females in order to produce better whelpers. Like the English Bulldog, the Aussie Bulldog has an affectionate, outgoing nature, without any of the natural reserve seen in most breeds. They are well known for being called water babies and love to go swimming in summer, and lay in the sun during winter months. Owners need to keep in mind that not all Bulldogs can swim, rather sink like a brick, so extra care around water is needed. Given the alertness of this breed, the Aussie Bulldog does have the ability to be a dependable watch dog at a mature age. Due to their intelligence and loyalty they are a very easy dog to teach at home, however, as with any breed of dog, professional obedience training is recommended. All Aussie Bulldogs should come with a breed certificate.